Headquarters (1963 Refuge HQ Road, Titusville, FL 32796). In accordance with Service guidelines and National Environmental Policy Act requirements, public involvement is an important factor in the development and review of a proposal. The Service conducted initial public scoping from August 23 to September 6, 2017. Those scoping comments helped inform the development of a draft Compatibility Determination and Environmental Action Statement for the phase-out of commercial fishing on Merritt Island NWR. A 30-day public comment opportunity allowed the public to review and comment on the draft Compatibility Determination and draft Environmental Action Statement, which included a description of the use, the proposed extension of the sunset date from 2018 to 2028, anticipated impacts, proposed stipulations, and permit conditions. The draft Compatibility Determination and draft Environmental Action Statement was made available for a 30-day public review and comment period ending March 30, 2018. The substantive comments received during public review and comment were reviewed in the development of the final Compatibility Determination and Environmental Action Statement. See the Public Involvement Appendix with the final documents for summaries of the substantive comments received and the Service's responses to those comments. Please direct any questions and requests for additional information to Layne Hamilton, Refuge Manager, at 321-861-2278 or MerrittIsland@fws.gov. One of the Most Successful Conservation Programs Continues to Raise Millions of Dollars for Birds and Habitat � Canada geese are flying to new heights as the stars of the 2017-2018 Federal Migratory Bird Hunting and Conservation Stamp, which went on sale June 27th. Merritt Island National Wildlife Refuge sells the stamps at their visitor center, located on Route 402 just 4 miles east of Titusville. The Visitor Center is open Monday through Saturday from 8AM until 4PM. Rangers accept cash for the $25 stamps which can be used as an annual entrance pass to the Refuge. Painted by five-time Federal Duck Stamp Contest artist James Hautman of Chaska, Minn., the new stamp will raise millions of dollars for habitat conservation to benefit wildlife and the American people. The Federal Duck Stamp plays an important role in wildlife conservation. Since 1934, sales of this iconic stamp have raised more than $950 million to conserve nearly six million acres of wetlands habitat on national wildlife refuges around the nation. "The American sportsmen heritage is not just something we talk about. Sportsmen and anglers are the strongest wildlife and habitat conservationists around, and the Duck Stamp is the perfect example of this," said U.S. Secretary of the Interior Ryan Zinke. "The stamp's impact goes beyond waterfowl, it also helps provide habitat for hundreds of species of wildlife and clean water for our communities. The lands set aside using Duck Stamp dollars provide opportunities for the American people to enjoy the great outdoors through hunting, fishing, and birdwatching, and help ensure this piece of American heritage will endure for generations." "The Federal Duck Stamp is the nation's most unique and successful conservation stamp. This program has been fueled largely by waterfowl hunters, who are required to buy a Duck Stamp each year and often buy more than one," said Greg Sheehan, Service acting director. "Birders and other outdoors enthusiasts, artists and stamp collectors also buy Duck Stamps, recognizing their benefit to species and habitat conservation beyond waterfowl, as well as their artistic value." Ninety-eight percent of the proceeds from the $25 Duck Stamp go to the Migratory Bird Conservation Fund, which supports wetlands conservation for the National Wildlife Refuge System. A current Federal Duck Stamp is also good for free admission to any national wildlife refuge that charges an entry fee. The Service is responsible for managing more than 850 million acres of lands and waters in the Refuge System, including 566 national wildlife refuges and 38 wetland management districts. Refuges offer world-class public recreation, from fishing, hunting and wildlife observation to photography and environmental education. Titusville: The U.S. Fish & Wildlife Service (Service) announces that they will be making some major improvements to the Beacon 42 boat ramp on Merritt Island National Wildlife Refuge. Thanks to a generous grant from the Florida Inland Navigation District, the Service will be installing a new concrete boat launching ramp at the site. The project also calls for a 20 foot long courtesy dock. The existing parking lot will also be upgraded with more clearly defined parking spaces and a new information kiosk. The ramp will be closed to all access while the work is being completed. The improvement project is slated to begin on June 5th, 2017. The Beacon 42 ramp allows boaters access to the central portion of the Mosquito Lagoon north of the Haulover Canal on the Refuge. It is one of two ramps on the Refuge that is open for boat launching after dark. Because of its location, it is also popular with waterfowl hunters. Improvements to the ramp are currently scheduled to be completed by September 15th, prior to the opening of the early teal season. For more information about the boat ramp project contact Steve Trull at 321-861-2352. 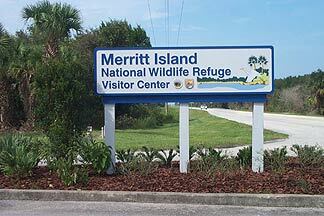 Merritt Island National Wildlife Refuge is part of the National Wildlife Refuge System which is administered by the U.S. Fish and Wildlife Service. The mission of the U.S. Fish and Wildlife Service is working with others to conserve, protect and enhance fish, wildlife, plants and their habitats for the continuing benefit of the American people. We are both a leader and trusted partner in fish and wildlife conservation, known for our scientific excellence, stewardship of lands and natural resources, dedicated professionals and commitment to public service. For more information on our work and the people who make it happen, visit www.fws.gov. Titusville: The U. S. Fish & Wildlife Service (Service) will begin accepting applications for commercial fishing guide permits beginning June 1st, 2017. Persons who do not currently possess a permit to guide on the Merritt Island National Wildlife Refuge (Refuge), and would like to secure one, have until June 30, 2017 to submit their application. Applications are available online at https://www.fws.gov/uploadedFiles/3-1383-C(5).pdf and can be emailed or delivered via the U.S. Postal Service. Submitted applications will be placed into a lottery. Currently there are 66 permitted fishing guides 3 permits are available for 2018. Those whose names are drawn will receive a prorated permit for 2018, plus the remaining months of July, August and September 2017. The drawing will be held at on July 7th at the Refuge Visitor Center, located on Route 402, 4 miles east of Titusville. Selected individuals must be able to meet the conditions of the permit including, licensing, insurance, and other requirements before a permit will be issued. For more information about fishing guide permit requirements and/or the lottery, please contact Tina Prichard at 321-861-5601. 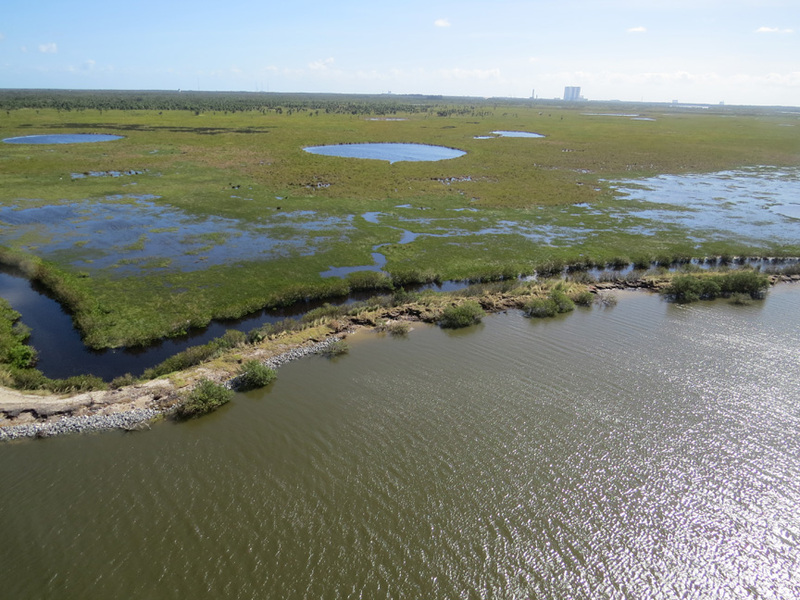 Brevard County: The US Fish & Wildlife Service (Service) has outlined a strategy to begin addressing safety concerns and habitat restoration at the St. Johns National Wildlife Refuge. The Service will be rebuilding the boundary fence, reinstalling appropriate signs, and increasing Law Enforcement presence. Law Enforcement saturation patrols have already begun and will continue before, during and following the fencing operations. Law Enforcement goals are to protect the public, Refuge staff, and contractors. Preventing the new fence from being destroyed, stopping vehicle trespass and trash dumping, and ending target shooting onto the Refuge are additional objectives. 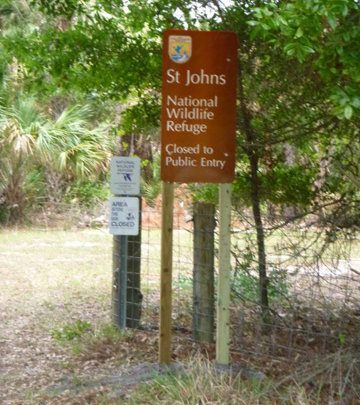 The St. Johns National Wildlife Refuge (SJNWR/ Refuge) is managed by the United States Fish and Wildlife Service. The SJNWR-Beeline Unit is closed to the public but recent activities have led to a series of safety concerns for Refuge employees and local residents. An increase in off-road vehicle trespass on the Beeline Unit has caused significant damage to natural resource by creating numerous new trails through wetlands. The south and southeast boundary fenceline has been torn down and boundary signs destroyed. Illegal shooting ranges are located adjacent to and on Refuge property which is dangerous for Refuge staff, local residents and wildland firefighters. Recent wildfires in the area increase the safety concerns for the public and wildland firefighters. A habitat management tool often used within the Service is cattle grazing. Refuge staff plans to evaluate cattle grazing as a management tool to maintain cordgrass marsh, to reduce woody vegetation and exotic vegetation. The Service has partnered with United States Department of Agriculture (USDA) - Natural Resource Conservation Service (NRCS), and will monitor cattle grazing under best use practices to evaluate its effective use. The presence of cattle on the Refuge is expected to have both an ecological and practical application. Cattle grazing will facilitate management efforts to reduce impacts of recreational activities on native vegetation by becoming a visual barrier. Cattle grazing will assist the Audubon's crested caracara (Polyborus plancus audubonii) which is a Florida population and is a threatened species. A properly managed 'Prescribed Cattle Grazing Plan', provided by will improve native plant communities and improve habitat for native wildlife by assisting where controlled burning or mechanical treatment is unavailable. During the recent wildfire on the SJNWR-Beeline Unit, there were several safety concerns with individuals trespassing. There will be some heavy equipment work to restore habitat and to rebuild the south and southeast fenceline. We are asking for your situational awareness to ensure safety with wildfire, heavy equipment, and barbed wire fenceline and to ensure reduced trespass. For more information please see the St. Johns National Wildlife Refuge website at www.fws.gov/refuge/st_johns or you may send comments to sjnwr_beelineunit@fws.gov. NASA announces that the repair work to the Haulover Canal Bridge will not be completed until November. While the structural repair work to the southern half of the draw bridge has been completed, work on the northern half is just beginning. Titusville: Merritt Island National Wildlife Refuge announces that access to Haulover Canal's southeast and southwest shorelines will be closed beginning May 9th for restoration work. In an effort to provide both a more enjoyable experience for visitors as well as make the habitat safe for wildlife, the U.S. Fish and Wildlife Service will shut down those shorelines temporarily to install additional trash cans and host a community cleanup. The south side of the canal will be closed to bank fishing during this time. Access to the Bairs Cove boat ramp will not be affected. The closure is needed to allow staff and volunteers time to clean up the excessive amount of litter in the area. 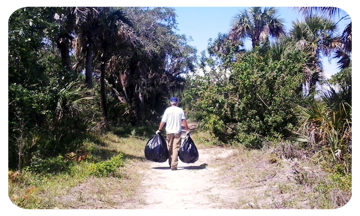 Although a clean- up was previously held in February of this year, the litter problem has once again exceeded the Refuge's capability to keep the area clean and safe for wildlife and visitors. The restoration work is scheduled to be completed by May 25th. All who are willing to help are welcome to volunteer in the community cleanup of the south side of the canal on Saturday, May 13th, beginning at 9:00 a.m. Efforts will take place on both the east and west sides of the canal bridge. Volunteers will meet at the Bairs Cove boat ramp turn off. Gloves and trash bags will be provided. Sturdy shoes, hats, sunscreen and water are recommended. Volunteers of all ages and experience are welcome to join in the litter pick up efforts. For more information about the clean-up contact Charlie DeVoe at 321-861-1421. Connect with us on social media at www.facebook.com/MerrittIslandNWR/ www.facebook.com/usfwssoutheast, www.twitter.com/usfwssoutheast, http://www.youtube.com/usfws, and http://www.flickr.com/photos/usfwssoutheast. This is a News Release from the U.S. Fish and Wildlife Service, Southeast Region. *Partnerships bringing giant sea cow back from brink of extinction* On the heels of Manatee Appreciation Day, the U.S. Department of the Interior announced the downlisting of the West Indian manatee from endangered to threatened. Notable increases in manatee populations and improvements in its habitat allowed the U.S. Fish and Wildlife Service (FWS) to change the species' status under the Endangered Species Act (ESA). "The Fish and Wildlife Service has worked hand in hand with state and local governments, businesses, industry, and countless stakeholders over many years to protect and restore a mammal that is cherished by people around the world," said U.S. Secretary of the Interior Ryan Zinke. "Without this type of collaboration and the commitment of state and local partners, this downlisting would not have been possible." In its review, FWS considered the status of the West Indian manatee throughout its range, which includes the Florida manatee subspecies, found primarily in the southeastern United States, and the Antillean manatee, found in Puerto Rico, Mexico, Central America, northern South America and the Greater and Lesser Antilles (see range map <http://www.fws.gov/southeast/wildlife/mammal/manatee/images/west-indian-manatee-range-map-lg.jpg> ). The downlisting means that the manatee is no longer considered in danger of extinction throughout all or a significant portion of its range, but is likely to become so in the foreseeable future without continued ESA protections. Although the downlisting represents a milestone for the manatee, the agency underscored that important challenges still remain to ensuring the species' long-term future throughout its range. As such, FWS biologists emphasized that the downlisting will not diminish any existing federal protections that will continue to play a vital role in the recovery of the species. The manatee will also continue to be protected under the Marine Mammal Protection Act. "While there is still more work to be done to fully recover manatee populations, particularly in the Caribbean, manatee numbers are increasing and we are actively working with partners to address threats," said Jim Kurth, the U.S. Fish and Wildlife Service's acting director. "Today we both recognize the significant progress we have made in conserving manatee populations while reaffirming our commitment to continuing this species' recovery and success throughout its range." Retrofitting water control devices such as those found at locks and levees, resulting in significant decreases in manatee fatalities. Power companies working cooperatively with federal and state conservation managers to address future loss of warm water outflows where manatees winter. Florida counties implementing manatee protection plans and reducing boater impacts. Increasing manatee access to several Florida natural springs while establishing sanctuaries for the wintering manatees in those areas during winter cold snaps. FWS working with the U.S. Coast Guard and FWC to minimize manatee collisions with vessels during high?speed marine events and other activities. Fishing gear cleanup and recycling programs reducing the threat from fishing gear entanglements. Rescue, rehabilitation and release efforts that help save dozens of manatees annually. Outside the United States, manatee population and abundance estimates are less certain. There are likely as many as 6,300 Antillean manatees spread over a much broader range, from the Mexican Gulf coast to northern Brazil and the Caribbean. 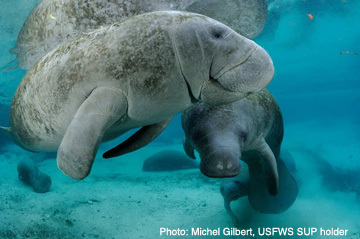 Background information on the Florida and Antillean subspecies is available at: http://www.fws.gov/southeast/wildlife/mammal/manatee/. Also, see the Frequently Asked Questions: http://www.fws.gov/southeast/wildlife/manatee/pdf/manatee-frequently-asked-questions.pdf for additional information related to the decision. Titusville: The U.S. Fish & Wildlife Service, Merritt Island National Wildlife Refuge, reminds visitors launching, landing or operating an unmanned aircraft from, or on lands and waters within national wildlife refuges, or flying drones at an altitude resulting in harassment to wildlife is prohibited unless authorized through a Special Use Permit. As the managing agency, the U.S. Fish and Wildlife Service is responsible for assuring that recreational and commercial uses are compatible with the refuge purpose to protect and manage its wildlife and to provide visitors with a safe and quality outdoor experience. The unauthorized use of unmanned aircraft, commonly known as drones, on Merritt Island NWR has increased during recent years with documented incidents of wildlife harassment. Additionally, drones over or near active wildfires or prescribed burning operations could be catastrophic if the unmanned aircraft interfere or collide with the refuge's firefighting aircraft. The Fish and Wildlife Service interprets the definition of "aircraft" (50 C.F.R. � 27.34) to include any device that is used for flight in the air without the possibility of direct human intervention from within or on the device. All associated operational elements, including cameras; sensors, communication links, and all of the components that are required for the system operator to control the device are considered part of the device. The term "aircraft" includes model aircraft, quadcopters, drones, powered gliders, and other unmanned aircraft systems. To inform the public of Merritt Island NWR's unmanned aircraft policy, signs will be posted at refuge kiosks and public notifications regarding the operation of unmanned aircraft will be available on the refuge website (https://www.fws.gov/refuge/Merritt_Island/) and Facebook page (https://www.facebook.com/MerrittIslandNWR). Titusville: The U.S. Fish and Wildlife Service announces, beginning January 1, 2017, Merritt Island National Wildlife Refuge will implement an increase to the daily fee and annual fee. The refuge daily pass will increase from $5.00 to $10.00. The refuge annual pass, valid for one year from the date of purchase, will increase from $15.00 to $25.00. The $25.00 Federal Duck Stamp, may also be used as an entrance pass. According to Refuge Manager Layne Hamilton, the fee increases are necessary to offset the costs of operating and maintaining facilities and safety services on the refuge. They also mirror similar increases at the nearby Canaveral National Seashore. Currently 80% of the revenue generated from fees stays at the Refuge and is used to fund visitor services projects. A new 30 foot concrete boat ramp and courtesy dock were recently completed at the Biolab boat launch. 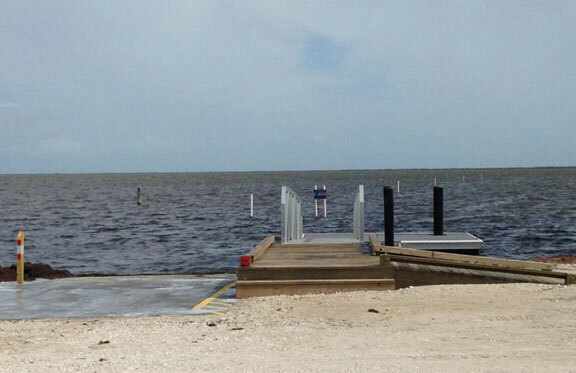 The new ramp has been relocated to provide direct access into the Mosquito Lagoon. The new location will reduce seagrass scaring in the local area by providing the public with direct access to the natural lagoon channel. Boaters are now able to launch larger vessels without power loading, reducing propeller dredging and siltation. This will protect vital sea grass beds which are an important lagoon habitat. It will also eliminate the need for power loading of boats onto trailers. A new kayak launching dock was also installed. The dock is fully accessible and will help anyone with mobility limitations to more easily enter and exit their kayak. The Service is excited to be able to offer this facility to visitors. It is the first of its kind in the County. Refuge daily and annual passes may be purchased at the refuge visitor center, located 6 miles east of Titusville on route 402. The visitor center is open daily from 8AM until 4PM. Daily passes may also be purchased at self-serve kiosks at various locations around the refuge including Black Point Wildlife Drive as well as each of the 3 main boat ramps.a Daily passes may be used at both the National Wildlife Refuge and the National Seashore. For more information contact the visitor center at 321-861-0669. Titusville, FL – The U.S. Fish and Wildlife Serviced announced today that after a thorough assessment, damage to facilities at the Merritt Island National Wildlife Refuge could total as much as $6 million to repair. Facilities include nearly 140 miles of levees of which more than 40 miles have sustained some type of storm damage. Many of the roads constructed along the tops of levees provide public access throughout the Refuge. One such road is the popular Biolab Road along the western edge of the Mosquito Lagoon. This road provides access to the lagoon to anglers and waterfowl hunters, bird watchers and tours of the adjacent impoundments are popular with participants in the annual Space Coast Birding and Wildlife Festival held each January. The Biolab road suffered significant damage due to overwash and erosion. The levees, which hold impounded waters, are managed both for mosquito control and wildlife management. In addition to the damage sustained to the levees themselves, over 150 water control structures used to manipulate the water levels in each impoundment were also damaged. Water levels may be held high to disrupt the breeding cycle of marsh mosquitoes. Flooded impoundments also grow the native food eaten by migrating waterfowl during the fall and winter. If the structures fail and water cannot be held, that will lessen the amount of foods available for ducks which would result in less ducks wintering on the Refuge thus impacting the upcoming waterfowl hunting season. Each year hunters contribute over $250,000 to the local economy. Some repairs have already begun. The work on Peacocks Pocket Road and other public areas began immediately after the storm and is ongoing. Other repairs will take longer as the Refuge has not received any additional funds to aid in storm recovery. When the Biolab Road or Oak and Palm Hammock trails will be repaired and re-opened is unknown at this time. The National Wildlife Refuge System protects wildlife and wildlife habitat on more than 150 million acres of land and water from the Caribbean to the Pacific, Maine to Alaska. Refuges also improve human health, provide outdoor recreation, and support local economies. Visit our home page at http://www.fws.gov/refuges/. The mission of the U.S. Fish and Wildlife Service is working with others to conserve, protect, and enhance fish, wildlife, plants, and their habitats for the continuing benefit of the American people. We are both a leader and trusted partner in fish and wildlife conservation, known for our scientific excellence, stewardship of lands and natural resources, dedicated professionals, and commitment to public service. For more information on our work and the people who make it happen, visit http://www.fws.gov/. On March 14, 1903, President Theodore Roosevelt signed an Executive Order creating Pelican Island as the country's first national wildlife refuge. Roosevelt went on to establish an additional 54 national wildlife refuges during his two terms and set historic conservation values for America. These values have grown into a system, which today, consists of 546 National Wildlife Refuges on more than 95 million acres of America's most important wildlife habitat. The U.S. Fish and Wildlife Service is the principal federal agency responsible for conserving, protecting and enhancing fish, wildlife and plants and their habitats for the continuing benefit of the American people. The Service manages the 95-million-acre National Wildlife Refuge System, which encompasses 546 national wildlife refuges and over 3000 "mini-refuges" called Waterfowl Production Areas. It also operates 69 national fish hatcheries, 64 fishery resource offices and 78 ecological Services field stations. The agency enforces federal wildlife laws, administers the Endangered Species Act, manages migratory bird populations, restores nationally significant fisheries, conserves and restores wildlife habitat such as wetlands, and helps foreign governments with their conservation efforts. It also oversees the Federal Aid program that distributes hundreds of millions of dollars in excise taxes on fishing and hunting equipment to state fish and wildlife agencies.